My first Linux distribution back in 2002 was Mandrake. It was a user-friendly, easy, and customizable Linux distribution so i had a love in the first sight at that time. 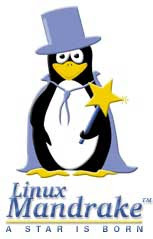 I got the ISO of Linux Mandrake from InfoLinux, a monthly Linux magazine that offered a Linux ISOs in their CD bundle. Without proper knowledge and no background on Linux at that time, i challenged myself to try dual booting my desktop machine into Windows and Linux and it worked!! I was so happy at that time and i had a resolution to use Linux as my main operating system. I tried to run Mandrake for some time and i switched back to Windows only when i need to work with tools only available in Windows platform. At the end, it all worked well and i used Mandrake for my daily work. Few years later, Mandrake changed into Mandriva and i became more active in this project by contributing to the i18n and l10n project of Mandriva. They offered me a VIP account so that i can download Mandriva Power Pack+ edition for free due to my contribution. I followed their release time by time and enjoying each release since it worked great until i moved to Slackware in 2005. Few days ago i heard that Mandriva, the company that support Mandriva Linux distribution is being liquidated. So sad to hear this company finally gave up after for several years struggling to maintain it's core business. So long Mandrake/Mandriva. Without you, i would never meet Linux and Open Source community. Good bye Mandriva!! !